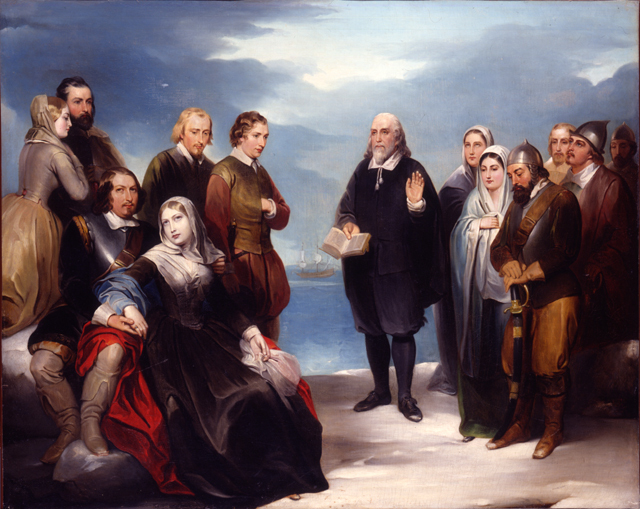 Anonymous, Landing of the Pilgrims, 1840-50, oil on canvas, 48 x 61 inches, Brigham Young University Museum of Art, gift of J. Earl and Elaine B. Garrett. In 1864, President Abraham Lincoln formally established Thanksgiving as a national holiday. Since then, the holiday has become rich with symbolic meaning as we think about the earliest days of the American colonies, and the coming together of the pilgrims and native Americans to celebrate a successful harvest in the autumn of 1621. Most importantly, Thanksgiving has become a celebration of families, as we gather together with those we love most for a communal expression of gratitude. Religious references abound in this portrayal of the Pilgrims’ arrival in the New World. The figures bow their heads or raise their eyes heavenward as the central figure blesses the land. Here, the Pilgrims gather around their spiritual leader, William Brewster. Miles Standish, wearing a suit of armor yet prayerful in posture, symbolizes the Christian soldier ready to take up arms for a holy cause. This story has gained mythic proportions, providing a history of strong moral values, a legacy of courage, and a precedent for religious freedom.